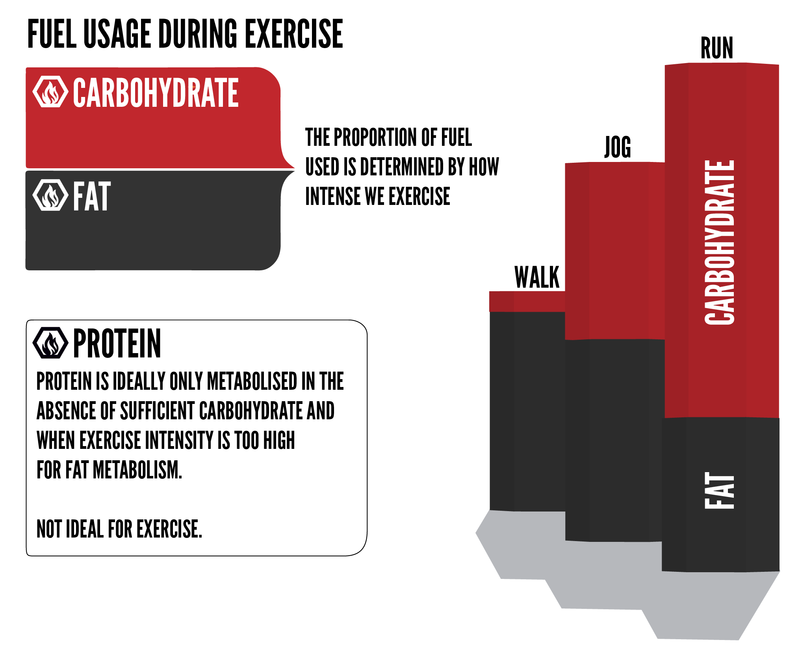 WHAT FUEL IS REQUIRED DURING EXERCISE? During high intensity or long endurance exercise, carbohydrate is your dominant fuel source. This is simply because fat and protein cannot be metabolised quick enough to keep up a supply of energy to meet the demands of the exercise. Within the body carbohydrate is stored as glycogen, and this glycogen needs to be broken down into glucose in order for energy to be produced. We store glycogen in our liver and muscles, but these stores become depleted after around 90 minutes of endurance, or even shorter when the intensity is high. That is why taking in carbohydrate around exercise is so key. Beforehand, carbohydrate is needed to ensure your stores are as topped up as possible. During you need to keep feeding your body carbohydrate to prevent complete depletion of your energy stores as this will not only affect your performance, but also your perception of effort and concentration level as fatigue builds. Afterwards carbohydrate is needed to restore those all important glycogen stores. Of course there are many carbohydrate options that you could choose from, but it’s important to consider the functional properties of the different sources in making your selection. As your heart rate climbs, more of your blood supply is diverted to your working muscles, heart and lungs, meaning that the supply to less key systems, such as your gastrointestinal system, becomes constrained. This limits digestion, and is the cause of GI distress when too much nutrition or too complex foods are eaten during exercise. The ideal carbohydrate choice needs to empty quickly from the stomach and be easily absorbed in the small intestine. This ensures energy delivery happens quickly and fluid balance is maintained. Easily digested carbohydrate options include simple sugars, such as glucose and fructose, and also some high GI longer chain carbohydrates such as maltodextrin. Overly complex carbohydrate molecules with a lower GI are less readily digested so are not a good choice. Whilst glucose and fructose provide the same amount of energy per gram as maltodextrin, they are not the best choices as they have a higher osmolality. This means that they empty much more slowly from the stomach and need more water to be absorbed with them. This can cause bloating and GI discomfort, and a higher risk of stomach upset. Fructose can be particularly problematic. Fructose is actually a low glycaemic index carbohydrate, meaning that the energy from it is slowly available. Whereas glucose is readily absorbed and can be used directly, fructose has to be digested, absorbed, and then processed by the liver before it is in a format the muscles can use to produce energy. This process typically takes at least 90 minutes, and glucose receptors must be fully saturated for this to occur. It is therefore not very suitable for high intensity exercise when you need the energy quickly as high rates of energy production are needed. Maltodextrins are long chains of glucose molecules linked together which break down very easily in the small intestine to be absorbed as glucose. Typically it is derived from corn. Technically maltodextrin is a complex carbohydrate because of it’s low sugar content, but as it still has as high a glycaemic index as simple sugar it goes through the digestive system very quickly without affecting fluid balance. This means it can provide excellent energy delivery with minimal risk to gastric comfort. You may recognise maltodextrin on the ingredients list of many food products, from salad dressings to baby food. There are many different grades of maltodextrin available, and it is often used as a texturiser in fat replacement or as a filler. The grade used in sports nutrition will be quite different though, chosen to give the exact properties required. Maltodextrin used in sports nutrition is of high DE (dextrose equivalent), meaning it mimics the behaviour of sugar without it tasting like or behaving like sugar.